This is the third and last sermon on the “Bread of Life Discourse” in John 6. The typical and easiest way to understand the entire discourse where Jesus says we must eat his flesh and drink his blood is as a reference to the Lord’s Supper. That isn’t wrong, but we do have to ignore that fact that when Jesus said it the crowds who heard it had no recourse to the sacrament. What this sermon attempts to do is proclaim the gospel from this most perplexing text with the sacrament not as first resource but as an gift that embodies for all time the truth. What I latch onto is Jesus’ embellishment of eating the flesh and blood as the gateway or image of Christ abiding or indwelling in us. Just as the Father dwells in Christ or Christ as the perfect icon of the Father, by eating Christ he dwells in us. Creation has always been about building a dwelling place or a temple for God. In Christ we have the perfect temple, and we are made the living stones as God dwells in us. As Christ is the icon of God, we become the body of Christ and icon of a sort (although that might be a little strong this side of the New Jerusalem). That flesh and spirit incarnation is always a scandal to the world which wants to keep them separate. Yet as Peter says – these are the words of eternal life. 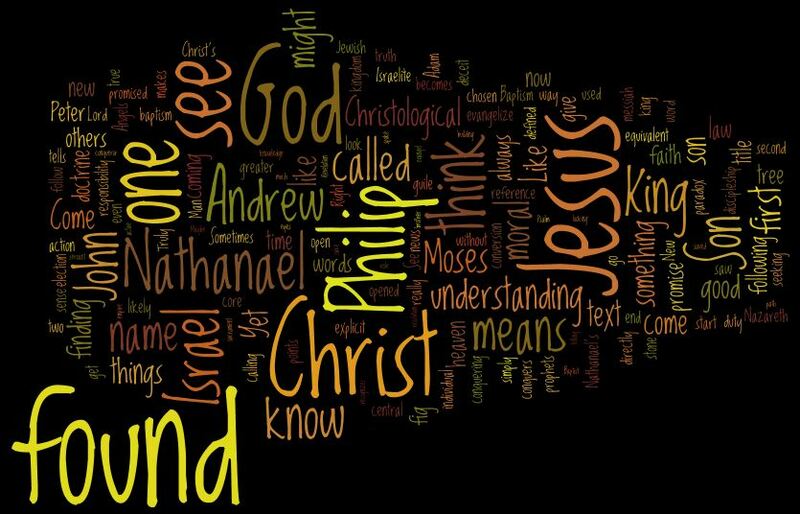 The second part of the gospel explored is Peter sequence where we believe first and then come to know. We must eat first – take Christ into us – to know. The body and blood of Christ give us a sure foundation. We can know because he is the bread that has come down. If we keep it outside of us, we can’t know. Belief comes first and it is belief from the heart. This was my vacation week. I left a sermon – the second in the John 6 triptych – for the service. We were still in the bread of life discourse and what we looked at in here was that bread as gift. The assigned readings take a three week tour though John 6. This chapter of John often gets called the bread of life discourse. That is fancy language for an extended teaching session between Jesus and the crowd after the feeding of the 5000 which was read from Mark a couple of weeks back. In this first section of teaching we have Jesus at what I would say is his most cryptic. The main thread is his claim that “I am the bread of life.” The background biblical story is the OT text of Israel in the desert after the exodus receiving manna. Manna, is actually a direct transliteration of the Hebrew and it simply means “what is it?” It is Moses that tells the it is the bread from heaven. Jesus picks that phrase up and encourages the crowds not to want temporal things (i.e. bread that spoils or after which you grow hungry again) but to desire the good stuff (i.e. eternal things) – the bread from heaven. The crowds pick up his drift as they ask about Moses, but they are still stuck on temporal things. They are still desirous of physical bread, hoping that this Jesus is a better Moses who can grant the manna for a longer time. 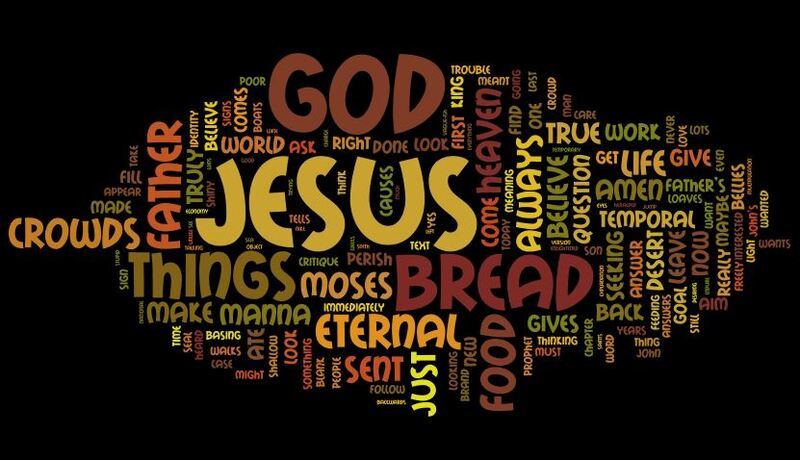 Jesus’ response is the staggering “I am the bread of life.” He is not a Moses testifying about the bread, nor is this bread like that manna which did go away, but this bread is eternal. The Word of God himself has appeared. The Father wants to give us this bread. And the only requirement is believe. So this will continue for the next couple of Sunday’s, but right now Jesus wants to get across a couple of items. If we are aiming for temporal things, however worthy they might be, we are missing the target. The Father wants to give you eternal things. Raise you eyes. Desire the good stuff. 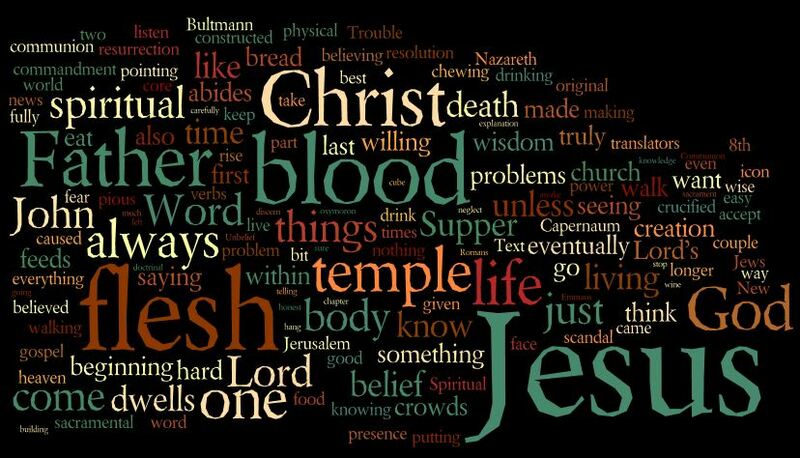 The second part of this is that the good stuff is the Word of God incarnate. 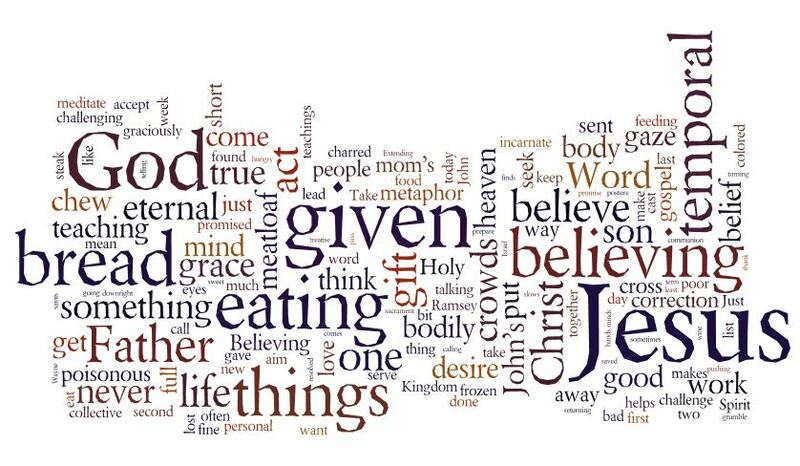 When we live by the word of Jesus, when we believe him we have life. And that bread brings us through this temporal world to eternal life. The text is chosen on the basis of an inclusio. An inclusio is a method in an era lacking punctuation to signal a thought grouping. We would call it a paragraph or a section break today. John writes a topic sentence – “If you love me keep my commandments” and closes the paragraph with a repeat – “whoever has my commandments and keeps them, he it is who love me”. So, the stuff between the inclusio is the supporting evidence for the assertion in the topic. In this case, if all we did was take the topic – “if you love me keep my commandments” – we’d be very deep into legalism. I tend to think Jesus was more of a moralist than most Lutherans, but he was also the greatest realist we’ve ever seen. After all, he made it all. You can’t get more real that that. And as that realist, telling fallen creatures to keep the law is not in the first place about keeping the law. We will fail. What it is about is driving us to some solution for our inability to keep the commandments. In John’s case, until the end of the age the solution is “another Helper”. That “another Helper” is the paraclete or the Holy Spirit indwelling within us. What this sermon does is trace out the works and means of the Spirit. It places the moral dimension within the larger story. 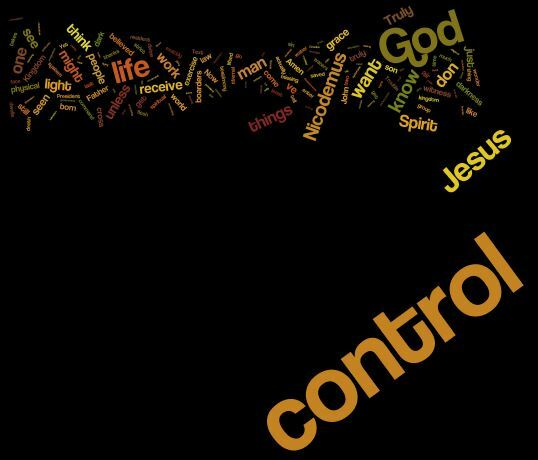 Jesus means “keep my commandments” within both his work and the work of the Spirit. And it looks at the final promises that this helper lasts “until that day” or “into the age”. (The forever of John 14:16 is a not the point of the εἰς τὸν αἰῶνα , which is really an eschatologogical phrase. He will be with you in this indwelling way as another Helper until the new age is fully realized.) At that point, the dwelling of God is with his people. No longer in a hidden way as with the Spirit which the world cannot see, but in a manifest way. This is the Christian Hope – we look for the resurrection of the dead and the life of the world to come. It was mother’s day, it was also the day often called Good Shepherd Sunday, so called because the reading comes from John 10 where Jesus says that he is the Good Shepherd. Except that the lectionary this year gives us not the shepherd but the ten verses often missed where Jesus proclaims himself the door. The sermon is a mapping of what that could mean. We look at the literal elements of a door brought up by the text: open, closed, proper entry, improper entry, protection. So, when Jesus says that “I am the door” those are the appropriate elements to ponder. What does an open door mean? What does a closed door mean? Since Jesus claims that he himself is the door, most of these things have Christocentric, that is Christ at the center, answers. In particular we examine election, justification and the door to prayer. 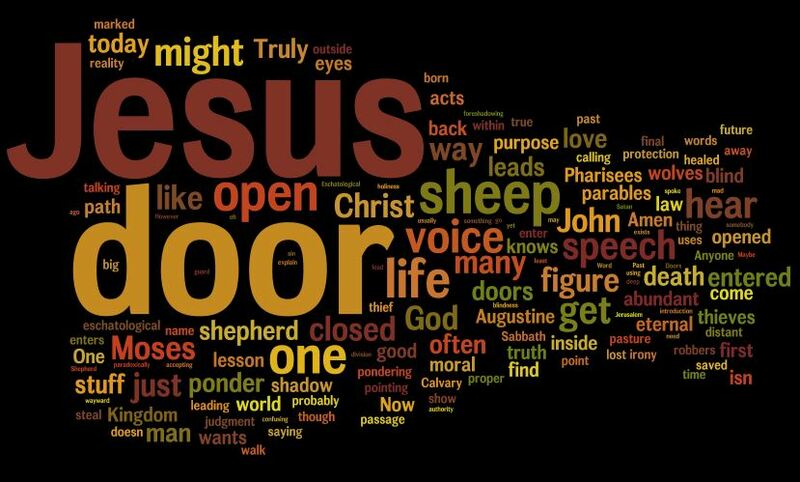 The sermon proclaims how the door works in these ways and teaches us how we should think of Jesus. We make two moral examples of how we should live today. And the sermon concludes with the eschatological or final things meaning of the door. Jesus has used a figure of speech – the door – to describe spiritual reality, so we spend some time pondering the core meanings. I’d invite you to give it a listen. A traditional theological education is usually divided into four areas: Bible, Doctrine, History and Practice. They of course are meshed together, but the point really is to acknowledge that we have different primary lenses through which we can reflect. I tend to default to the Bible which I think leads me to a couple of quirks compared to the LCMS in general which is a Doctrine first body predominately. I’d just say the difference is between messy and clean. Doctrine is clean;the Bible can be messy. Doctrine is the math proof that leaves out a few steps as “obvious” that are not at all obvious to the layman or student. Practice tends to be the warm fuzzy pile where we are reminded it is not about the bible or the book of doctrine but the lost sheep of the house of Israel. The one that gets lost is History. Partly because it takes study. You have to read it. Partly because even if you read it you have to figure out how to preach it. And partly because if the bible is messy, try history. 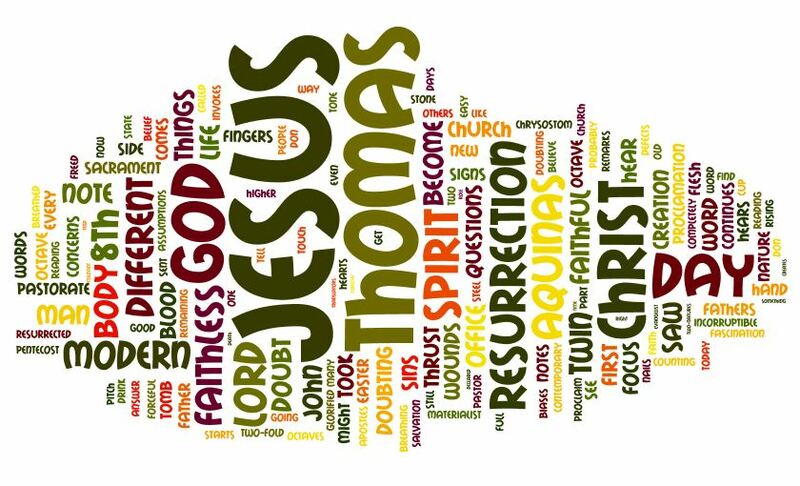 This sermon is an attempt to look at how different ages of the church read and reacted to Doubting Thomas. Every age has their own fascinations and trials. This text is a sharp example of that which I think gave itself to a method of actually preaching Jesus. I’d invite you to have a listen or give it a read. Of the images or metaphors of what Jesus has done for us I think husband or marriage is one the most different and compelling. And while it hovers over the entire biblical story, there just aren’t that many text that are most directly seen as a proclamation of the Bride and Bridegroom. In my reading this text is a biblical Romantic Comedy, and as such it is about the Bride and Bridegroom. The structure used is something I’ve been playing around with occasionally, a limited use of the church father’s 4 level allegory. In my playing with this outline what I’ve found is that the literal level allows you establish the text and any connections to the modern day. In this case the text follows all of the Romantic Comedy beats. Knowing that it is such a genre, opens the door to the Typological level. Jesus is not just anyone but the bridegroom and the Samaritan woman is not just any woman but the type of the bride, the church. Following from the fourth beat of the Rom-Com script we find out what the protagonist (Jesus) wants to accomplish. In this case for the bride to know the gift of God and to know who offers it. That is the basis of the moral level, coming to know the Spirit and Word and Sacrament as the gifts of God or the living water, and knowing Jesus who offers them. The last level is the eschatological. In this case the end-times image is of the wedding feast of the bride and the lamb brought to its fulfillment in the New Jerusalem. At that time we won’t be arguing about the where’s and why’s of worship, because there is no temple in the New Jerusalem, because the bride and the bridegroom are together. John has typically defeated me as a preacher. He’s too thick or maybe I should say not linear. This outline has helped me present texts from John. The other thing I’d add is that while allegory has a bad name because of some of the extreme uses of it, I don’t think it is wholly deserved. Most preacher’s outlines are just a collapsing of the four levels to usually two. 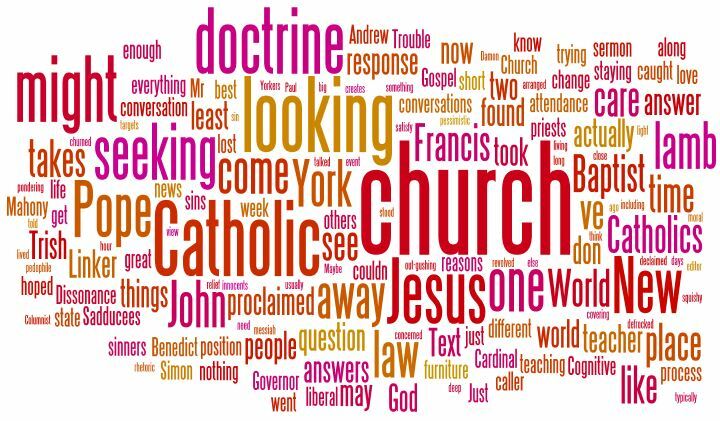 Text-Application, often call puritan plain style or even just Wesley’s outline, is literal and moral levels typically. Hence it can often come across as all law or Jesus as our great example that we should follow. Law-Gospel usually ends up being literal and typological. You always get Christ, but also the problem with much of Lutheran preaching never actually having a moral point. True pentecostal preaching is usually literal and eschatological which gives it that on fire or otherworldly nature. If you respect the limits that you can’t say anything in the three upper levels not clearly established in the literal then I’ve found it to be a robust outline. I’d invite you to take a look and give me any comments.